The complicated issues of politics in the 1780s were paralleled by related, real-life dramas far removed from the scenes of government. 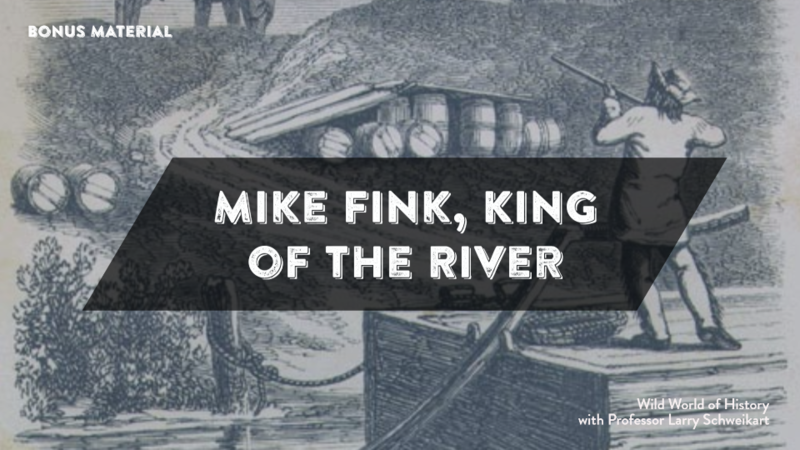 For example, shortly after John Jay negotiated with Spain’s Don Diego de Gardoqui over American trading rights on the inland rivers, Big Mike Fink was pioneering the burgeoning river traffic of the Ohio and Mississippi rivers. Fink gained such a mighty reputation during America’s surge west of the Appalachians that he was dubbed King of the River. Back in the days before steam power, the produce of the American frontier—pork, flour, corn, animal skins, and whiskey—was shipped up and down the Ohio and Mississippi rivers on thousands of flatboats and keelboats. Flatboats were crude flatbottomed craft that could travel only downstream; keelboats were sleeker sixty-foot craft that could be poled upstream by the Herculean efforts of their crewmen. Early rivermen lived hard lives, enduring the hazards of ice, fog, snags, sandbars, waterfalls, and even Indian attacks as they plied their trade in the early West. Upon sale of their cargoes in Natchez or New Orleans, most rivermen walked back to their Ohio Valley homes via the Natchez Trace, braving the elements and attacks from outlaws. Mike Fink so captured the public imagination that oral legends of his exploits spread far and wide and ultimately found their way into print in newspapers and almanacs. According to these stories, Fink was “half horse, half alligator” and could “outrun, out-hop, out-jump, throw down, drag out, and lick any man in the country!” In some tales, Fink outfoxed wily farmers and businessmen, cheating them out of money and whiskey. He could ride dangerous bulls, one of which, he said, “drug me over every briar and stump in the field.” The most famous and oft-repeated Mike Fink story is one in which he, à la William Tell, shoots a “whiskey cup” off a friend’s head. These are good yarns, and some of them were no doubt true. But who was the real Mike Fink? Born near Pittsburgh, Pennsylvania (at the headwaters of the Ohio River), around 1770, Fink grew into a fine woodsman, rifleman, and frontier scout. He took up boating around 1785 and rose in the trade. He mastered the difficult business of keelboating—poling, rowing, sailing, and cordelling (pulling via a rope winch) keelboats upstream for hundreds of miles against the strong currents of the western rivers. Fink plied the Ohio and Mississippi during the very time frontier Americans angrily disputed Spanish control of America’s downriver trade. By the early 1800s, Fink owned and captained two boats headquartered at Wheeling, West Virginia. Working his way west, Fink’s career paralleled that of American expansion into the Mississippi Valley, while at the same time reflecting the coarse and violent nature of the American frontier. One of the few documented accounts of the historic Mike Fink is an early nineteenth-century St. Louis newspaper story of his shooting the heel off a black man’s foot. Responding to an advertisement in the March 22, 1822, St. Louis Missouri Republican, which called for “one hundred young men to ascend the Missouri River to its source” and establish a fur trading outpost in the Montana country, Fink was hired to navigate one of the company’s keelboats up the Missouri, working alongside the legendary mountain man Jedediah Smith. An 1823 feud between Fink and two fellow trappers flared into violence that led to Fink’s murder. Thus ended the actual life of the King of the River. But mythical Mike Fink had only begun to live. He soon became a folk hero whose name was uttered in the same breath with Daniel Boone, Andrew Jackson, and Davy Crockett. Celebrated in folklore and literature, Mike Fink’s legend was assured when he made it into a 1956 Walt Disney movie. Michael Allen, Western Rivermen, 1763–1861: Ohio and Mississippi Boatmen and the Myth of the Alligator Horse (Baton Rouge: Louisiana State University Press,1990), pp. 6–14, 137–39.